Defines a 5 x 5 matrix that contains the coordinates for the RGBAW space. Several methods of the ImageAttributes class adjust image colors by using a color matrix. The matrix coefficients constitute a 5 x 5 linear transformation that is used for transforming ARGB homogeneous values. For example, an ARGB vector is represented as red, green, blue, alpha and w, where w is always 1. When implementing a translation using the ColorMatrix class values specified are added to one or more of the four colour components. A value that is to be added may only range from 0 to 1 inclusive. Note that adding a negative value results in subtracting values. A good article that illustrates implementing a ColorMatrix can be found on MSDN: How to: Translate Image Colors. The following code snippet provides the implementation of the ApplyColorMatrix method. The ApplyColorMatrix method signature defines a parameter of type Image and a second parameter of type ColorMatrix. This method is intended to apply the specified ColorMatrix upon the Image parameter specified. The source image is firstly copied in order to ensure that the image that is to be transformed is defined with a pixel format of 32 bits per pixel, consisting of the colour components Alpha, Red, Green and Blue – PixelFormat.Format32bppArgb. Next we create a blank memory bitmap defined to reflect the same size dimensions as the original source image. 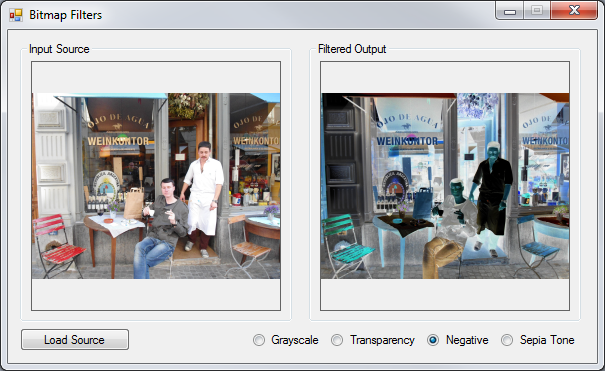 A ColorMatrix can be implemented by means of applying an ImageAttribute when invoking the DrawImage defined by the Graphics class. The GetArgbCopy method creates a blank memory Bitmap having the same size dimensions as the source image. The newly created Bitmap is explicitly specified to conform to a 32Bit ARGB format. By making use of a Graphics object of which the context is bound to the new Bitmap instance the source code draws the original image to the new Bitmap. The transparency filter is intended to create a copy of an image, increase the copy’s level of transparency and return the modified copy to the calling code. Listed below is source code which defines the DrawWithTransparency extension method. Due to the ApplyColorMatrix method defined earlier implementing an image filter simply consists of defining the filter algorithm in the form of a ColorMatrix and then invoking ApplyColorMatrix. The ColorMatrix is defined to apply no change to the Red, Green and Blue components whilst reducing the Alpha component by 70%. 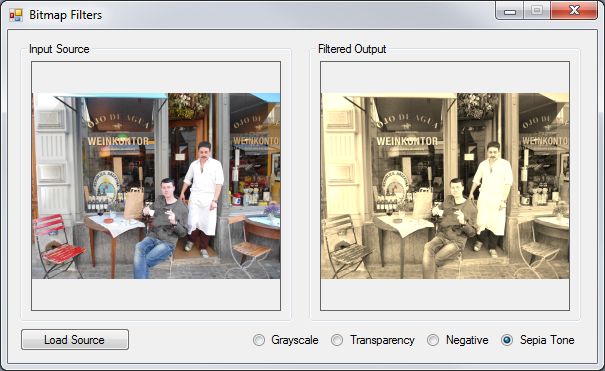 The grayscale filter is achieved by adding together 11% blue, 59% green and 30% red, then assigning the total value to each colour component. 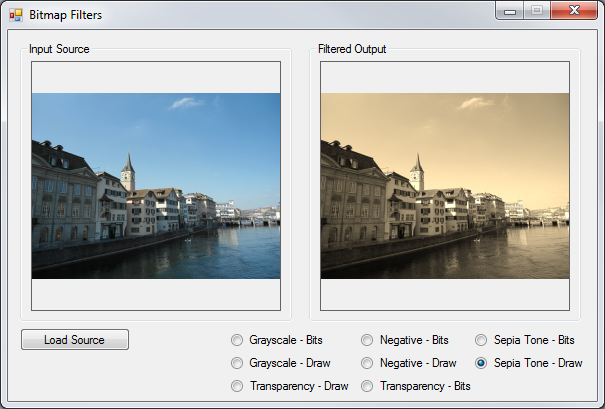 The sepia tone filter is implemented in the extension method DrawAsSepiaTone. Notice how this method follows the same convention as the previously discussed filters. The source code listing is detailed below. We can implement an image filter that resembles film negatives by literally inverting every pixel’s colour components. Listed below is the source code implementation of the DrawAsNegative extension method. Notice how the negative image filter subtracts 1 from each colour component, remember the valid range being 0 to 1 inclusive. This ColorMatrix in reality inverts each pixel’s colour component bits. The transform being applied can also be expressed as implementing the bitwise compliment operator on each pixel. 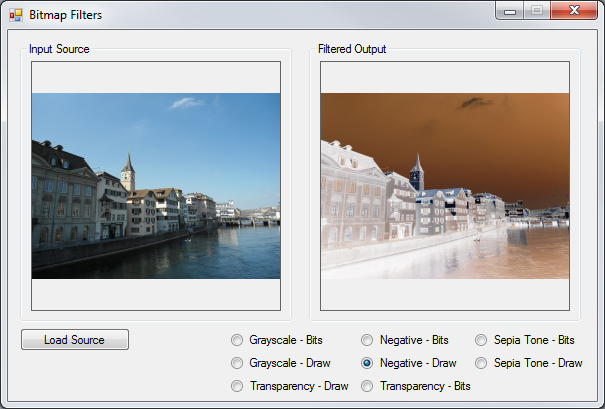 The image filters described in this article are all implemented by means of a Windows Forms application. 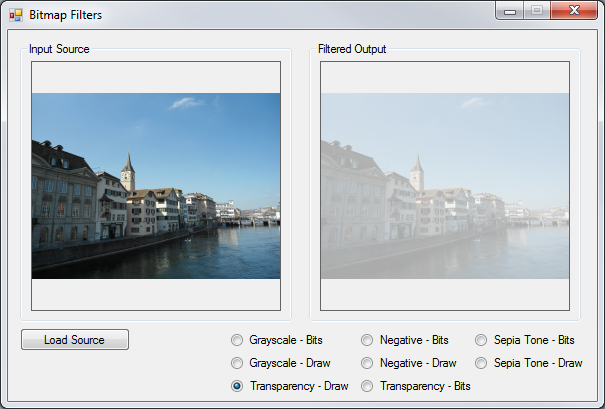 Image filtering is applied by selecting the corresponding radio button. The source image loaded from the file system serves as input to the various image filter methods, the filtered image copy returned will be displayed next to the original source image. ARGB is an abbreviation for the term: “Alpha, Red, Green and Blue”. ARGB refers to four colour components represented by each pixel that forms part of an image. In C# 32 bit ARGB images are a fairly common occurrence, each pixel being of a fixed size, namely 32 bits or 4 bytes, which also equates to a standard integer. Each colour component consists of 8 bits or 1 byte, equating to a range of possible values starting at 0 inclusive and a maximum value of 255 inclusive. It can thus be logically deduced that each of the four ARGB components can be expressed as a value ranging from 0 to 255 inclusive. A pixel’s alpha component represents a level of transparency, 255 being no transparency and 0 being completely transparent. The combination of Red, Green and Blue values together represent a single colour, the colour associated with an individual pixel. 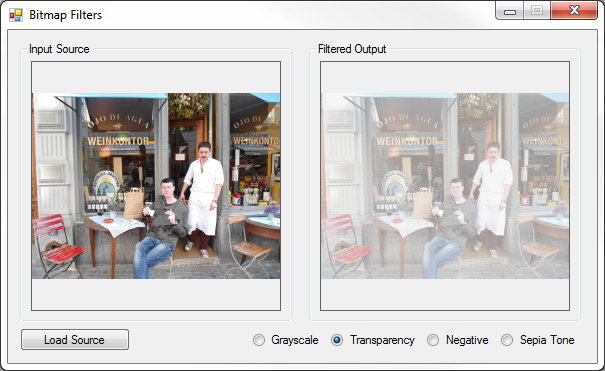 We can apply filtering on an image by manipulating the individual Alpha, Red, Green and Blue components of each pixel. The transparency filter is intended to create a copy of an image, increase the copy’s level of transparency and return the modified copy to the calling code. Listed below is source code which defines the CopyWithTransparency extension method. As discussed earlier, the CopyWithTransparency method creates a 32Bit ARGB formatted copy of the specified source image by invoking the method GetArgbCopy. In order to extract the image pixel data we implement the BitmapData class and the LockBits method defined by the Bitmap class. Next we create an IntPtr which references the very first pixel. BitmapData.Scan0 points to the memory address of the first pixel. Next the source code instantiates a byte array which will used to represent pixel components. The Marshal.Copy method copies bytes from memory, starting at the address of the first pixel continuing up until the last pixel. The alpha component can be specified by the calling code, or if not specified defaults to a value of 100 due to being a optional method parameter. How much transparency results from an alpha component of 100? If the maximum value is set at 255 representing no transparency 100 expressed as a percentage of 255 equates to roughly 39.2%. Defining an alpha value of 100 will thus result in an image being roughly 60% transparent. Notice how the for loop only affects every fourth array element, beginning at index 3. Each element in the byte array represents a pixel colour component, either Alpha, Red, Green or Blue. Remember as mentioned earlier, the components are in fact stored in the format Blue, Green, Red, Alpha. Every four array elements together represents one pixel. We only want to change the value of Alpha components, thus we start at the first pixel’s Alpha component at index 3 and then continue to iterate through the byte array, incrementing the index by four with each loop. After having updated every pixel’s Alpha component the modified byte array is copied back into the actual image object and returned to the calling code. 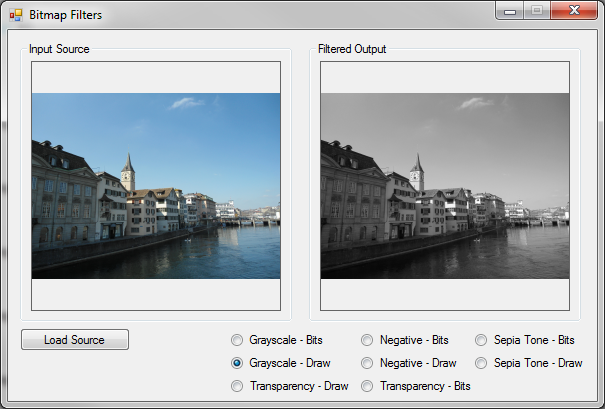 The grayscale filter operates in a fashion similar to the transparency filter discussed in the previous section. The following details the source code implementation of the CopyAsGrayScale extension method. Notice how this filter starts iterating the pixel components at index 0. The source code assigns a weight to each colour component. 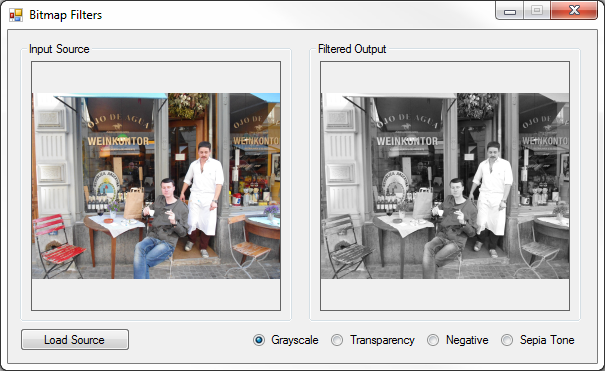 The grayscale filter is achieved by adding together 11% Blue, 59% Green and 30% Red, then assigning the total value to each colour component. Transparency is set to 255, effectively disabling any level of transparency. The sepia tone filter is implemented in the extension method CopyAsSepiaTone. Notice how this method follows the same convention as the previously discussed filters. The source code listing is detailed below. If any of the totalled values exceeds the value of 255 that value is then defined as 255. We can implement an image filter that resembles film negatives by literally inverting every pixel’s colour components. It is fairly simple to invert colour data by implementing the bitwise compliment operator ~, the result being each bit will be reversed. Note: Only colour components are inverted, the Alpha component remains unchanged. Listed below is the source code implementation of the CopyAsNegative extension method. The negative filter formula extracts the four ARGB components storing the result as an integer value which represents a pixel. All of the pixel’s bits are reversed using the bitwise compliment operator. The resulting integer value is converted back into the four pixel components and assigned to replace the pixel’s original values, all except the alpha component.